Pinnacles National Park is not one of the more famous parks in California. Completely overshadowed by famous destinations like Yosemite, Death Valley, and the Redwoods, Pinnacles barely registered with us when we started thinking about our route through the state. 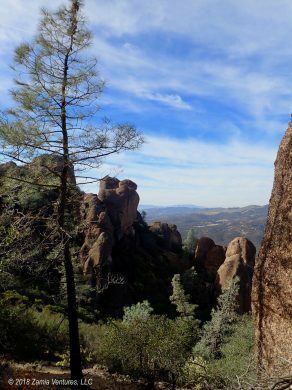 Judging from the blank looks we received from family members at Thanksgiving when we mentioned that our next visit would be to Pinnacles, we were not alone in knowing very little about this park. However, it was a convenient stop on our journey south from the San Francisco Bay area, so we planned to spend five days in the park to explore the area. Similar to Point Reyes, Pinnacles turned out to be a delightful surprise in many ways. The wildlife and scenery were absolutely remarkable and stunning. Can’t believe this oak tree is alive! One thing I knew coming in is that Pinnacles is condor territory, and we were eager to see some of these huge animals in the wild. After our visit to the Center for Birds of Prey in Boise, which is one of the major breeding centers for condors released into the wild, we had experience identifying the 9-foot wingspan and distinctive white markings of the breed. Happily for us, the condors were out in force during our visit. They roost in the craggy rock formations that give Pinnacles its name, and harness the rising thermals to soar high into the sky. 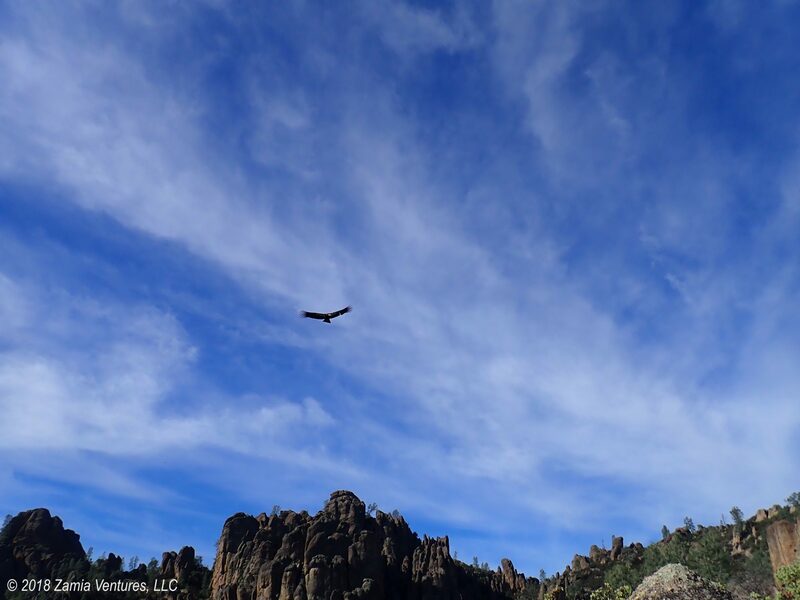 We loved seeing the condors wheeling slowly and seemingly without effort around the dramatic peaks of the park. Our best condor experience was during our first hike in the park, as we were ascending the aptly-named Condor Gulch Trail in the morning. A group of three condors was just beginning their morning flight, and emerged from the cliffs not too far above us. As we walked up the trail toward the top of the peaks, the birds were skimming above the ridge of the mountain and flying only about 30 feet above us as we walked up the trail. From that close proximity, we could easily see their markings and even hear the gentle whirring of the wind in their feathers as they skillfully glided ever higher. It was one of the more awe-inspiring wildlife encounters we’ve experienced so far, and it was far from the only one to be had at Pinnacles. We had daily visits in the campground from small groups of deer and flocks of plump turkeys. At night, the whole campground pulsed with the noise of hundreds of birds in the surrounding trees reporting to each other on the events of the day. On the trails, we regularly encountered deer, California quail, a variety of squirrels, and even several bobcats! Bobcat on the trail ahead! In addition to the prolific wildlife, we loved the scenery and the trails. The Pinnacles sit along the San Andreas Fault and were formed by volcanoes 23 million years ago. The ancient peaks are now weathered and rounded into bulbous shapes that seem more welcoming than forbidding, and the trails feature an interesting mixture of wet and dry environments. Sheltered areas are covered in thick mosses and veined with small rivulets and creeks. The dry environment is covered in prickly, water-conserving chaparral plants that explode with blooms in the spring. We particularly loved the big berried manzanita, Arctostaphylos glauca, which sports a blood-red trunk resembling melted wax and cheerful light green foliage. The gray pine, with its wispy needles, lent the landscape a magical quality when sunlight was shining through the crown. The prominence of heat advisories on all the trail signs suggests that this park has extreme temperatures in the summer, but for our late-season visit we enjoyed temperatures in the 60s. This was perfect for exploring the excellent trails in the park. Some of the trails are relatively flat, creeping alongside creekbeds to offer different views of the peaks in the center of the park. Other trails lead from the valley floor all the way into the top of the peaks, perfect for up close examination of the unusual formations and for enjoying sweeping views across the surrounding Gabilan Mountains. What really sets these trails apart is the fun factor. Some trails involve scrambling through boulder-filled caves, while others go up and over the highest peaks on steep, narrow sections of “stairs” carved into the rock with only thin handrails to keep hikers safely on the trail. As a short person who fits in tight spaces, and who has no particular issues with close spaces or heights, I absolutely loved the variety and challenge of the trails! Ken – who is tall, does not love tight spaces, and definitely does not love heights – was somewhat less enthusiastic. We particularly enjoyed the fact that the challenging elements of the trails were limited in scale. Our cave scramble on the Balconies Trail was probably only a quarter of a mile long, which is plenty of time to spend climbing over boulders in darkness. Had it been significantly longer, I’m pretty sure the novelty would have been replaced by a creeping claustrophobia. 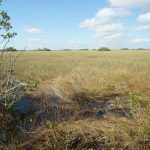 Between the wildlife, the breathtaking scenery, and the interesting physical challenges, these are some of the best trails we have hiked yet, although there is some doubt about whether Ken will ever let me select a hiking trail again. Entrance to Balconies Cave at bottom right! Wildlife was not the only serendipitous encounter during our visit. We also ran into fellow full-time travelers and bloggers Laurel and Eric (www.ravenandchickadee.com) on the trail at Pinnacles. It’s a good thing I was wearing a Campendium T-shirt, since Laurel stopped to comment on our mutual favorite camping resource. We soon realized that we were both travel bloggers, and she had just started following my blog recently! Although we only had a very short overlap in our stays at the campground, it was really cool to connect with other travelers that we had previously only known virtually. The only thing we didn’t love about Pinnacles was the campground. It was kind of a dump – by far the worst campground we’ve seen at a national park. 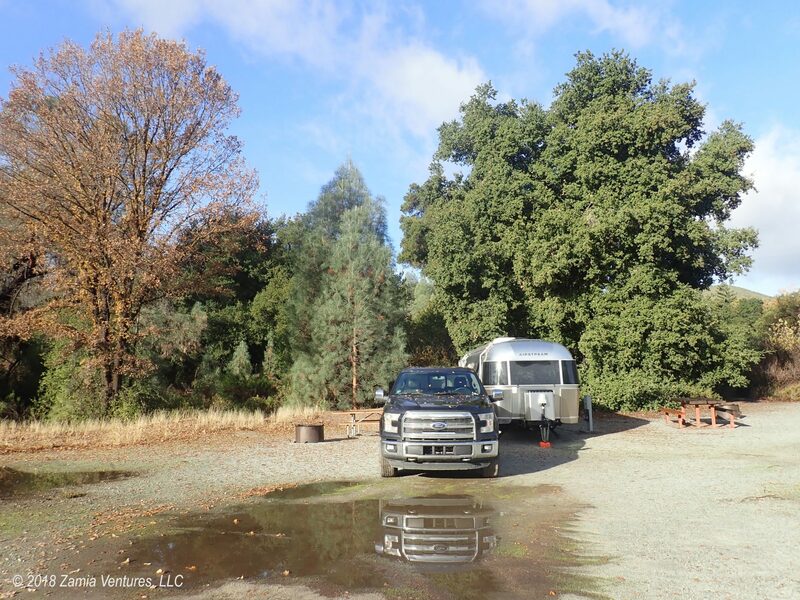 The RV camping area was basically a large dirt lot, with no clear definition to the sites and a dirt loop road filled with large, deep, muddy potholes. The bathhouse, with just two showers and two stalls, was woefully undersized to serve 150+ campsites as well as day use visitors. Most significant, the bathhouse was in dire need of replacement. The feet on the stall dividers were corroded to nothing, the stall doors didn’t close, and the pay showers were gross. The neglect makes some sense, given that Pinnacles is one of the lesser-visited parks in California. The visitor center was basically only open on weekends during our stay, and the entrance was essentially a voluntary self-pay stop. Still, the national park service can (and should) do better! We were delighted to run into you two on that fabulous High Peaks trail—I’m glad you were wearing your Campendium t-shirt, and that you were so smart to figure out who the heck we were! We wish we could have spent more time together sharing travel stories. Next time, for sure. You had the absolutely best condor sightings, and I’m super jealous of your bobcat encounter. (But I’m happy for you, really :-)) That was our second visit to Pinnacles, and once again we realized we shorted ourselves on time. Two nights just isn’t enough! The awful showers and no water hookups make a longer stay a bit challenging, but it’s still worth it. Hope you’re enjoying Morro Bay—although I’m behind on our blog, I do have a couple of postings from previous visits if you want to check them out. Don’t miss the sea otters! With your wildlife magnetism, you’re sure to see lots. I can’t wait to check out Morro Bay! Pismo Beach has been great so far – quaint and with a huge beach. Luckily the ATV and vehicle traffic is at a minimum this time of year.